Years ago (like over 25...) my husband mentioned "I wish we could just take a pill for all of our nutritional needs... it would make things so much easier." Apparently bachelor guys in the Air Force may not have the time or desire during pilot training to really cook, and may perhaps end up eating Lean Cuisine type meals over and over and over for nearly a year. Hence... the idea of a pill isn't so bad. Me?? Growing up with a dad in the restaurant business (Dad had the Windjammer in Tiburon, CA if you happen to remember it) spoiled me rotten, and I found the idea of living on a pill somewhat appalling. As such I've spent these 25 years showing my husband that food is a good thing, it can not only be nutritionally sound but also tasty, satisfying and fun. I'm happy to say he's come around, and I actually laugh as he works with me to plan our vacations around researched restaurants. He's done wonderfully well enjoying and looking forward to food until an issue about a year ago. Last Christmas we gifted ourselves one of those super powerful blenders and began blending up all sorts of tasty drinks. Until my husband began blending, that is. Reverting to his old ways, he felt that the more he put into one blended drink, the healthier it was, and it didn't matter how it tasted. And trust me... it didn't taste good. The color of mud and with essence of grass clippings, he stuffed so much "healthy stuff" into the drinks no one else could - or would even try to - get them down. Back to basic training, I've been working to show him that certain flavors work better together, and that perhaps stuffing an entire day's nutrition into one blended drink might not be the optimal idea. He grumbled at first, then muttered, "Fine... see if you can do better." 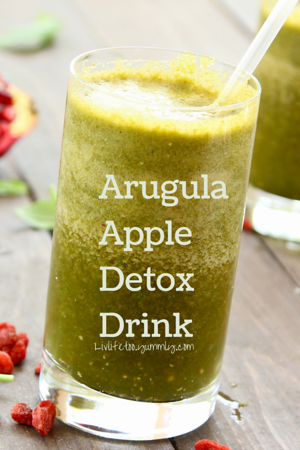 Enter the Arugula Apple Detox Drink. Just 7 ingredients plus ice, yet bringing a few superfoods together to provide a super healthy, one has an enjoyable green drink. 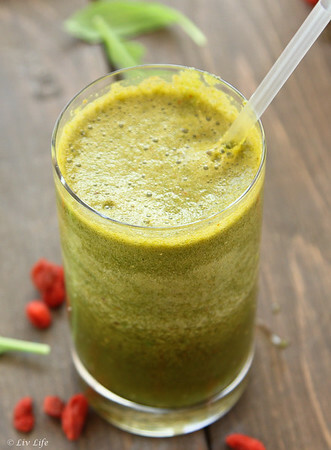 After a weekend of indulging I often find the need to fill myself with healthy ingredients, and I find this green drink a nice way to start the day, or perhaps to finish a day off. But... best music to my ears? "Honey... can you make that blended drink you made the other day?? You know... the one that didn't taste like grass clippings??" My work here is done. 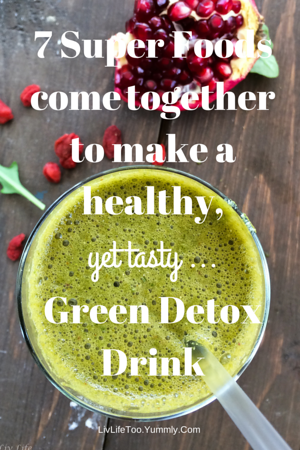 Just a few super food ingredients blended together for a healthy, yet still tasty green drink that always helps me to feel better after over-indulging. Place all ingredients into your blender and blend to desired consistency. Enjoy! Sounds like what I need right now! And such a pretty color. Bravo Kim! I would gladly share this with you, so just let me know next time you have leftovers :-) PS-My hubby loves ALMOST everything I make, and goes gaga for Brussels Sprouts, but he wrinkles his nose every time I offer him one of my green drinks. Oh, well...Cheers to you!